Pesto is a unique green sauce that originated from the piquant basil grown around the city of Genoa and is now loved the world over. Pesto alla Genovese is the famous bright green “pasta sauce” from the northern Italian region of Liguria, whose capital is the city of Genoa. My introduction to pesto, which was not a part of my southern Italian upbringing, was from one of those little glass jars I found in a grocery store in Peoria, Illinois. The jar had been labeled “pesto” by an Italian company. Back then, I was trying to learn to cook true Italian “regional” cooking and specifically to expand my sauce-making techniques beyond the ubiquitous and well-loved southern Italian red tomato sauce. When the spaghetti was ready, I drained it and poured some of the thick, dull green pesto from the jar over my hot spaghetti and mixed it to coat. Was I supposed to use the entire jar? I wasn’t sure. I tasted it. It wasn’t too bad, but really, it wasn’t very good either, and I wasn’t really sure why. After all, pesto is a famous dressing for pasta. Millions of people love it! Not one to give up easily, a few weeks later, I tried to make a pesto sauce for my pasta again. The second time, I emptied the contents of my jar of pesto into a small pan to warm the sauce. Even worse! Now, I know that pesto is a “cold emulsion” type of “dressing” for pasta and should never be cooked! But, as I said, back when I was first introduced to pesto, I really had no experience about how it should be prepared or how it should taste. Pesto—a method, NOT a recipe! I realized at once that the directions above were really a method rather than a recipe, and this is the secret to pesto—one must find his or her own favorite combination of ingredients and method that works best. 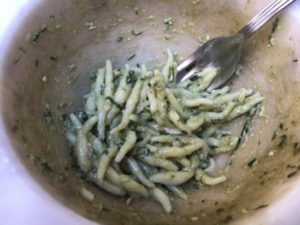 So I started on my journey to discover my own “true” pesto alla Genovese with the ratio of ingredients above, not really knowing exactly how many basil leaves to include in my “4 small bunches of basil leaves,” or exactly how to use a mortar and pestle. But I did discover one thing to be true: fresh basil leaves led to freshly made pesto, and this was the key to a delicious and aromatic pasta dressing! After much reading on the topic, I learned that the name “pesto” comes from the Italian verb “pestare,” which means “to crush/to mash.” After more reading and many, many more attempts, I learned that the sequence for crushing the ingredients makes a difference. First, mashing the garlic and pine nuts into a paste allows the garlic to receive the crushed basil, cheese, and olive oil more easily. (Also, halve the garlic and remove any bitter green stem that may have started to grow before processing the garlic.) I no longer roast my pine nuts. Adding the basil leaves a little at a time and most of the salt when most of the basil leaves have been crushed seems to help to get the right consistency and to keep the vibrant green color of the pesto. Much trial and error led to a basil/pine nut/cheese ratio that I liked, although in truth, once I started to make fresh pesto, a wide range of ratios of ingredients worked. The amount of garlic can be varied—less or more, depending on taste—although I like to keep the garlic/pine nut ratio equal. For a quick dinner during the workweek, it is even possible to make pesto by pulsing all the ingredients together in a food processor, although, of course, this method does not allow the full flavor of the pesto to bloom and would certainly not be considered authentic pesto alla Genovese in Liguria! But how should pesto be served? I thought I had my pesto method complete many years ago. Fast forward to about a year ago, when one of my favorite Italian travel bloggers, Victoria DeMaio, wrote about her experience learning to make pesto on tour, from the city of pesto’s birth, Genoa. Click on the link Presto! It’s Pesto! to read her full blog post in “PostcardZ from Victoria” if you like. Once again, pesto returned to the forefront of my culinary experimentation. 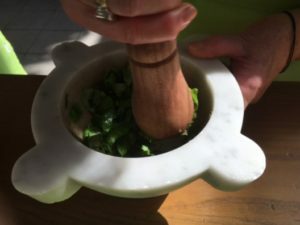 Finally, directly from Liguria, through Victoria’s blog, I learned what a typical mortar and pestle used in Liguria looks like and how to use them! To make authentic pesto alla Genovese, one must purchase a fairly large Carrera marble mortar and use a large wooden pestle. In Liguria, every bride receives this important wedding gift from her family before departing for her new family life. Click on the link to watch Victoria’s YouTube video, “Let’s Make Pesto with Mario and Cristina in Genoa Where Pesto Originated.” You will learn a bit about Genoa and see Mario’s mortar and pestle technique for crushing basil leaves. Notice the basil plant he is holding in the beginning of the video to show the approximate number of basil leaves needed for making one batch of pesto! I also learned from Victoria’s blog post, Presto! It’s Pesto!, that the traditional pasta served in Genoa with pesto alla Genovese is called trofiette. (See below for details). This pasta is not easily found here in America, though, and I like to dress gnocchi and spaghetti with pesto, as is commonly done throughout northern Italy. I did know that pesto should always be served with a white wine, because its herbaceous character does not mix well with red. In her blog, Victoria mentions the local Genovese white wine called Vermentino. The last “link,” so to speak, in the chain of events that led to my understanding of how to make an authentic pesto alla Genovese is perhaps the most important: the type of basil that should be used. The Ligurians believe that the basil grown in their region, Basilico Genovese DOP (Designazione di Origine Protetta, or Protected Denomination of Origin), which was granted by the European Union in 2015 is the only basil to use for authentic pesto alla Genovese. Basil was originally introduced throughout Italy by the Romans. (The Romans loved to cook with herbs, and they created what some consider an early form of pesto using basil leaves called “moretum.”) The specific type of sweet basil grown in Liguria for which the DOP designation is held is said to have very little or no undertones of mint and a more piquant and complex taste than the most common variety of sweet basil. The pungent aroma released when these basil leaves are crushed is what gives the wonderful fragrance of true pesto alla Genovese. To fall under the Basilico Genovese DOP designation, along with the variety of basil grown, the location where it is grown is important. Basilico Genovese DOP must be grown in a narrow strip of land “between the mountains and the sea” that encompasses the provinces of Genoa, Savona, and Imperia. The best Basilico Genovese DOP is said to be grown in a small village named Prà, just west of the city of Genoa. Basilico Genovese DOP is grown year-round in these provinces, with greenhouses in use for many years to allow the year-round, continuous production. So, what does all this mean for us here in America? Can we produce high-quality basil for our own version of pesto? After being introduced to Metropolitan Farms just west of Chicago last May, I would venture to say that the answer to this question is “yes,” and in a uniquely creative way! 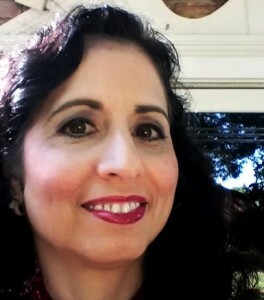 The event that I attended last May, titled Metropolitan Farm Tour: Explore an Urban Ag Destination, was organized by Catherine Lambrecht, long-time Culinary Historians of Chicago director and director of the Chicago Foodways Roundtable. 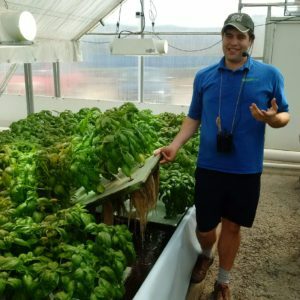 Metropolitan Farms uses a relatively new technique called aquaponics to create a closed-loop greenhouse system that can produce hydroponically grown herbs and lettuce and fish for local sale year-round. The system is composed of two greenhouses, one for fish tanks and the other for the greens to grow hydroponically. The fish (tilapia, in this case) provide the fertilizer for the greens as they grow; water from their tanks is piped into the hydroponic system that circulates around the roots of the plants. The water from the plants is then filtered and piped back into the fish tanks. The greens are grown in carefully regulated, advanced greenhouse conditions, which create healthy, undamaged plants without the need for pesticides. As part of their crop, Metropolitan Farms grows high-quality Genovese basil from seed, year-round, as is done in Liguria. Most of their basil is sold wholesale. They also make their own pesto (several varieties) for local sale. Walking through the Metropolitan Farms greenhouse, I could almost smell the fragrant pesto that would come from this ingenious system. I’ll end this blog post with a photo of Benjamin and his wonderful basil, and we’ve come full circle, as the wonderful fragrant basil I grew in my own garden was really the impetus for the many years I spent discovering the details of how to make pesto alla Genovese in the first place! Benjamin Kant of Metropolitan Farms in Chicago showing his Genovese basil growing method. Note: Before starting, set a large pot of well-salted water on the stove to boil, and cook your pasta to “al dente” tenderness (“to the tooth). Time the pasta so it finishes cooking just before the pesto is complete. Keep in mind that fresh pasta and gnocchi will take far less time to cook than dried pasta. Put the garlic cloves into the mortar with a few grains of salt and begin to crush. Add the pine nuts and continue to crush into a smooth paste. Remove the garlic/pine nut mixture from the mortar to a small bowl. Put a few of the basil leaves and a few grains of salt into the mortar and begin to crush, using the method shown in the link to the video in this blog post. As the basil leaves become crushed and release their essential oils, add a few more. Continue to crush the leaves, adding a few at a time, until all are crushed fairly uniformly. Add whatever salt is left to the crushed basil leaves, the garlic/pine nut mixture, and then drizzle in a bit of olive oil. Combine. Add the cheeses and a bit more olive oil. Combine. Drizzle in the rest of the olive oil while continuously stirring the garlic/pine nut/ crushed basil/cheese mixture until a creamy dressing has formed. Reserve 1 to 2 tablespoons of pasta water and mix into the pesto to warm. Quickly drain the pasta and put the warm pasta into a large serving bowl. Dress with your pesto, mix to coat, and serve immediately! If you would like to preserve your pesto rather than use it right away, it can be frozen in small plastic containers. Top off with a small amount of olive oil. Leave a small amount of room in the container for the liquid to expand and then cover. Basil is an annual plant and, with some exceptions in warmer climates, will not reseed on its own. It grows easily from seed after the threat of frost is over and when the soil has warmed in cooler climates. It is advisable to plant seedlings, though, in order to have basil readily available throughout the summer. The basil plant will grow a center stalk of small white flowers, which will then go to seed. Pinch this off when you see it; if you allow the plant to go to seed, it will die shortly thereafter. To overwinter basil, cut a stalk from the top of the plant with as long a stem as possible. Try to do this before the plant has started to go to seed, when it is still in the growing phase. Place the stem in a small container of water, and watch the roots appear. When a small ball of roots has formed, it is ready to plant in soil. See “Growing Italian Herbs” from Zuppa, Insalata, e Verdure (Soup, Salad, and Vegetables) by Kathryn Occhipinti © 2006, Italian-American Society of Peoria.